This article is a short summary of The Legend of Zelda: Oracle of Ages and Oracle of Seasons. 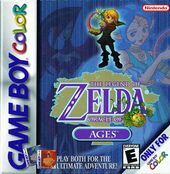 The Legend of Zelda: Oracle of Ages and The Legend of Zelda: Oracle of Seasons are dual 2D installments in The Legend of Zelda series, developed by Flagship and Capcom in collaboration with Nintendo and released simultaneously in 2001 for the Game Boy Color. In Europe, a Limited Edition package was released that included both games, a shirt, two pins, Game Boy Color and Game Boy Advance skins, and a boomerang. Only 500 copies of this version were released. Transcend the very fabric of time with the Harp of Ages. Rescue Nayru, the Oracle of Ages, to save the Land of Labrynna from Veran, Sorceress of Shadows, who will pitch the world into an endless night. Travelling through time presents Link with unique challenges. If a river blocks Link's path in the present, he can travel to the past and move a stone, redirecting the flow of water. If he plants seeds in the past, he'll find full-grown trees and vines when he returns to the present. 'Released on the Game Boy™ Color system in 2001, The Legend of Zelda™: Oracle of Ages™ and The Legend of Zelda™: Oracle of Seasons™ represent the pinnacle of classic 2D Zelda gameplay. Now you can play these classics on your Nintendo 3DS™ system! When played together, these two games offer an ultimate adventure not possible when each game is experienced on its own. The games feature a link system that unlocks access to additional content that you can't access any other way. Oracle of Ages and Oracle of Seasons present separate yet connected stories that allow the games to be played in either order. In Oracle of Ages, Link is transported by the Triforce to the land of Labrynna. After waking up in a forest, Link saves Impa from a crowd of monsters and is asked to help her find a woman in the forest. They eventually find the woman, Nayru, singing to a group of forest animals. However, it turns out that a sorceress named Veran had hidden herself inside Impa and emerges to possess Nayru, revealing that she was the titular Oracle of Ages and using her newfound powers to disrupt the flow of time in Labrynna. Link later learns from the Maku Tree, the guardian of Labrynna, that he must find the Essences of Time in order to reach Veran's castle and save Labrynna. In Oracle of Seasons, the Triforce sends Link to the land of Holodrum. After waking up, he comes across a traveling troupe and dances with their lead act, Din. However, they suddenly hear a voice, calling himself Onox, and a funnel cloud appears that kidnaps Din, revealed to be the Oracle of Seasons. Din's capturing results in the Temple of Seasons sinking into the ground, and the seasons of Holodrum going into disarray. Link learns from the Maku Tree of Holodrum that he must find the Essences of Nature to enter Onox's fortress and save Din and Holodrum. 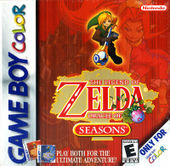 Both Oracle of Ages and Oracle of Seasons offer similar basic gameplay, structured similarly to the previous title, The Legend of Zelda: Link's Awakening. Each title, however, places emphasis on a different aspect of gameplay: Oracle of Seasons focuses primarily on combat, while Oracle of Ages focuses on puzzles. Progression in Oracle of Seasons requires using the Rod of Seasons to manipulate the seasons, altering the terrain of the area, for progression, while in Oracle of Ages the player uses the Harp of Ages to travel through time, progressing by manipulating the time flow to alter the land. Both titles also feature the ability to be connected to create a Linked Game. After completing one of the two games, the player will be given a password that can be used in the other title to "continue" the story, allowing the player to obtain special items in each game. Other passwords can also be used to obtain special secrets. Yoshiki Okamoto of Flagship originally approached Shigeru Miyamoto with a proposal to remake The Legend of Zelda for the Game Boy Color. Plans were later made to develop six The Legend of Zelda games for Game Boy Color, released in a succession of around four to five months. Two of the six games would be based on past The Legend of Zelda titles, while the remaining four would be completely original. Development progress was slow, due to factor's such as the Game Boy Color's smaller screen compared to a television, having to rewrite the scenario and change the gameplay and maps several times for cohesiveness, and the team being divided on whether or not to produce the remake or immediately work on a new Zelda title. Asking Miyamoto for advice, development instead began on what was known as the "Triforce" series, a set of three interconnected games focusing on one specific aspect of gameplay. Eventually, these games would be known as the "Mystical Seed" series: The Legend of Zelda: Mystical Seed of Power, Mystical Seed of Wisdon, and Mystical Seed of Courage. However, due to difficulties with coordinating three linked games, the team instead decided to develop two games, and Mystical Seed of Courage was canceled. KOR: April 20, 2016. Direct ports of the two games released as a digital downloads on the Nintendo eShop for Nintendo 3DS, allowing for special emulator features. In North America, for three weeks following games' release, both games were offered at a discounted price. ↑ 1.0 1.1 Miyamoto Speaks on Zelda GBC. IGN (August 23, 1999). Retrieved April 1, 2017. ↑ 2.0 2.1 Six Times Zelda. IGN (July 28, 1999). Retrieved April 1, 2017. ↑ The Legend of Zelda: Oracle of Seasons Interview Part I. Nintendo. Archived March 11, 2005. Retrieved April 1, 2017. ↑ 4.0 4.1 The Legend of Zelda: The Third Oracle [unofficial title]. IGN. Retrieved April 1, 2017. ↑ Okamoto on Zelda. IGN (September 16, 1999). Retrieved April 1, 2017. ↑ Zelda's Tri-Force Down To Two. IGN (July 24, 2000). Retrieved April 1, 2017. ↑ Zelda: Oracle of Ages And Seasons To Launch At Discounted Price. Siliconera (May 17, 2013). Retrieved March 31, 2017. This page was last edited on 15 October 2018, at 06:14.